Donuts Slot -▶️ Spin those reels for 2,041 Ways to Win! Do you suddenly have a sweet tooth? If so, take a few spins on the delicious Donuts slot from Big Time Gaming. The slot may have a simple design, but as in most other slots from this provider, there is always more than meets the eye. The developers have added a very attractive and delicious bonus feature where players can win multipliers and free spins to win big! 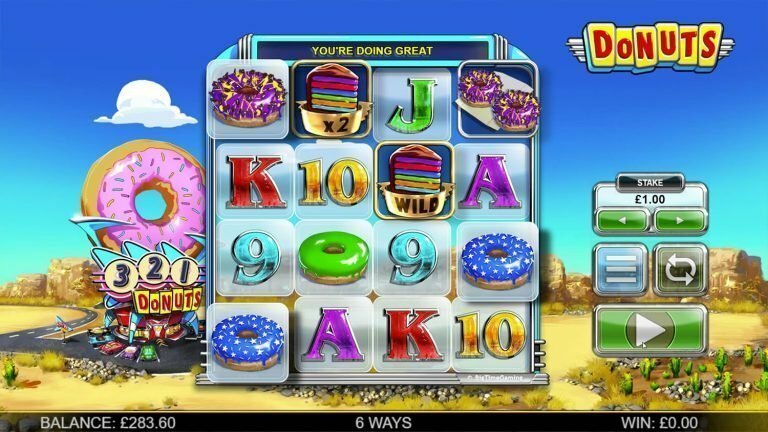 Donuts is a 4-reel, 4-row video slot with up to 2,041 ways to win. As the slot name implies, this game is inspired by donuts and is sure to catch your attention, even if you don’t have a sweet tooth. 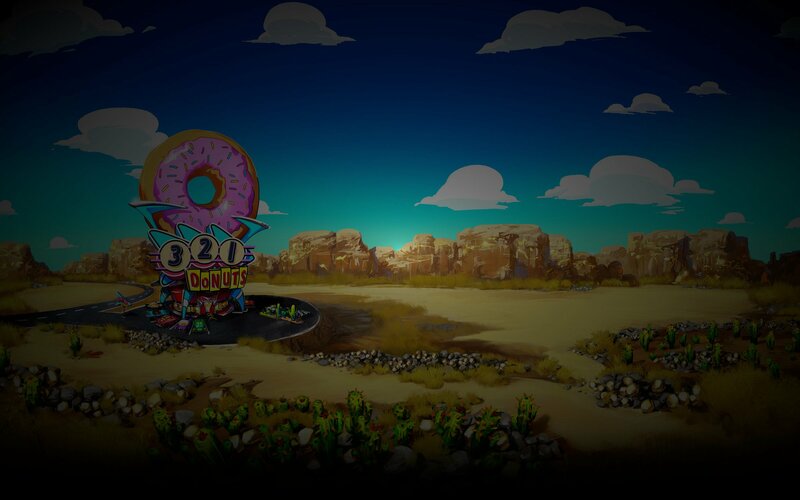 The reels of the game are set in an open field with a donut shop in the background. The designers also added interesting background sounds which make the game play more fun. Playing the game is as easy as eating a donut. Just set your bet to the desired value and hit the Spin button. You can also use the Auto Play option. Base play in the game can also be rewarding thanks to the extra features. Each Wild symbol can appear on reels 2 or 4 to substitute for other symbols, plus the Donut Box will open and reveal its contents, which can be up to 4 additional donuts or a multiplier of x2 or x4. These small details make playing Donuts slot fun and rewarding to play. As expected, the top paying symbols in the game are the four Donut symbols. The highest payout comes from the purple donut with the sprinkles, while the rest have smaller payouts. Landing 4 of the top paying donut symbols on the reels will let you walk away with a payout of 15 times your total stake. The low tier symbols in the game are the card symbols which can range from 9 to A. The Special symbols in Donuts are the Wild, Gold Donut Scatter with Bonus written across it and the Donut Box. The Wild will substitute for all of the regular game symbols; three or more Gold donut symbols triggers the free-spins feature, while the Donut Box can increase the wins. Donuts video slot has a bonus mini-game tied to the free spins feature. This bonus mini-game gets played before the Free Spins as described below. The free spins feature is triggered by getting 3 or more gold donut scatter symbols anywhere on the reels. Before the free spins are played, a bonus mini-game is awarded where the number of free spins and the multiplier is determined. As you spin the reels during the mini-game, the aim is to get as many gold donuts onto the reels, with each revealing a multiplier between x1 and x50. During the mini-game, there is a countdown which resets each time you get a gold donut, but once the count-down reaches zero, the mini-game ends and the free spins begin. The accumulated multiplier from the bonus round is applied to all wins during the free spins. It is very possible to have an x20 or x30 multiplier, which as you can imagine, transforms a small win into a massive one. As the free spins play out, every 2, 3 or 4 gold bonus donuts symbols on the reels will award an extra 10, 20 or 30 free spins accordingly, plus there is no limit, so you can keep racking free spins if Lady Luck isn’t off snacking on donuts. Donuts does not have a fixed jackpot or any kind of progressive jackpot. While this might be a drawback for some players, the insane multipliers and chance of winning more and more free spins are like winning a jackpot and can deliver huge payouts! Donut doesn’t have traditional paylines. It’s 2,041 ways to win slot, meaning that wins are formed in specific patterns with 3 or more matching symbols starting from reel 1. The RTP value of Donuts is set at 96.54%. Like many other slots coming from Big Time Gaming, Donuts is a highly volatile game. This means that it can eat up a lot of your balance but can also produce massive payouts during the bonus rounds. The big payout potential makes the high volatility worth the risk. If you’re a fan of the video slots coming from Big Time Gaming, you will surely enjoy Donuts. Even though the game has a simple design, it has a lot to offer when it comes to payouts. The things which make the game attractive are the free spins feature and the big payout potential. The free spins bonus can produce massive wins if you manage to rack up a high multiplier in the mini-game and get some extra spins during the feature. After that, you can just sit back and enjoy the sweet rewards! Take Donuts slot for a spin right now at Rizk!